Soil Pollution is the contamination of soil caused by the addition of chemical substances resulting in the reduction of soil productivity and adversely affecting yield of the crops grown on it. The toxic substances percolate through the soil layers underneath to contaminate the ground water. The agricultural waste primarily due to farmland drainage contains washings of chemical fertilizers which contribute to the soil pollution. 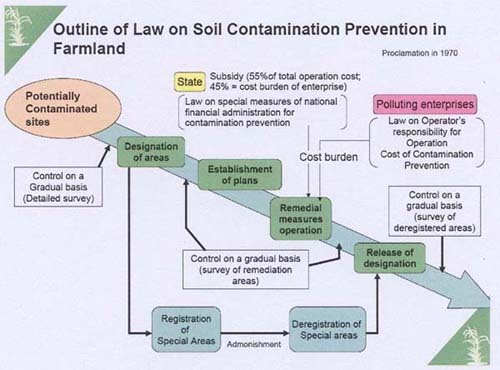 Soil pollution differs from water pollution and air pollution in the sense that the pollutants remain in the direct contact with the soil for relatively long periods, sufficient to change the chemical and biological properties of the soil. 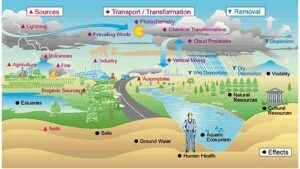 The hazardous chemicals can also enter the human food-chain from soil or water plants and endanger it. Indiscriminate dumping of municipal and industrial wastes on land. 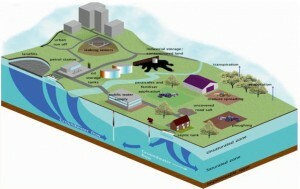 The toxic chemicals leach into the soil and pollute ground water sources. Modern agricultural practices require cultivation of high-yielding crops through hybrid seeds requiring use of chemical fertilizers and pesticides to increase yield and quantity of crops. Sustained use of these chemicals for several decades’ results in heavily polluting the ground water in the region. The agricultural practices followed by the farmers are to continue with the set cultivation patterns and methods rather than going in for multi-cropping. Besides, the heavy subsides provided by the state agencies on the new agricultural inputs induces farmers to use the harmful synthetic chemicals instead of safe natural ones. There is also reluctance on the part of farmers to adopt traditional organic methods. 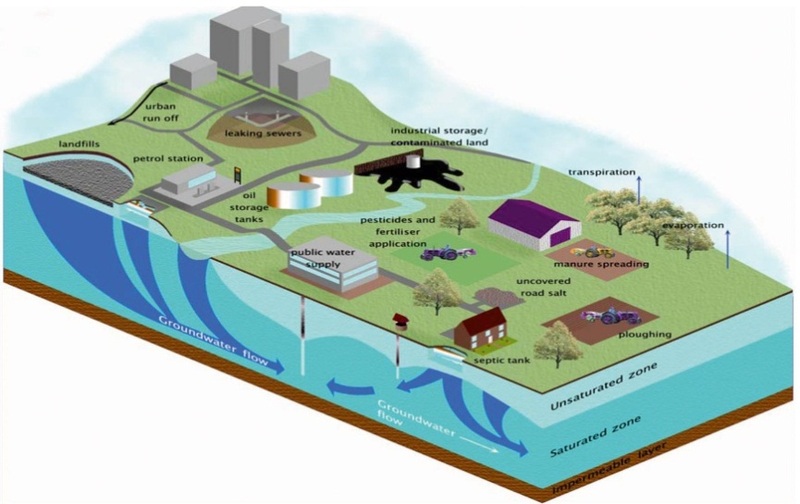 Industrial waste water containing high quantities of mercury, arsenic, cadmium from industries like electroplating, bulb and metal-making may reach ground water through soil. Fly ash emanating from coal-based thermal power plants is another alarming source of soil pollution (by degrading the soil): Besides, wastes discharged from tanneries contribute pathogenic bacteria in the soil. Mining of minerals and their processing to extract the required metal involves deep and extensive excavation, laying bare large swaths of soil exposed to environmental weathering and degradation of soil. The concentration and processing of the ore for the extraction of the metal result in the production of a large quantity of finely-divided staff for tailings which are left undisposed in the vicinity of the mining and processing establishments. Besides, smelting and subsequent treatment of ores result in the emission of arsenic, lead, cadmium and sulphur dioxide in large quantities discharged into the atmosphere, thereby causing air pollution. 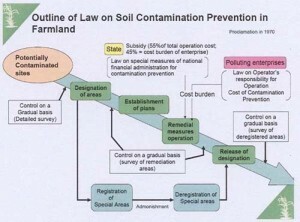 The effects of soil-agricultural pollution are harmful and are associated with the sources causing pollution, as enumerated below. Solid wastes containing human, animal excreta when disposed on land pollute the soil through the generation of pathogenic bacteria, which could affect vegetable crops grown on the soil an the human health in the food-chain. Inadequately treated or untreated sewage-sludge when applied on land may decrease soil fertility or its productivity. Pesticides like DDT, aldrin, diedrin etc. when sprayed on crops may damage/kill microbial activity. Once normal function of the soil is disturbed, it loses its capacity of nutrient regeneration; with the result soil particles disintegrate leading to soil erosion. Pesticides when absorbed by plant could reach humans via food-chain and cause health hazard. Synthetic fertilizers employed to increase soil fertility may actually interfere with soil microbial activity. The fertilizer-enriched soil cannot support microbial flora which is essential to enrich the humus that helps in plant growth. When NPK fertilizer is used in excess, there is a considerable reduction in the protein content of the crop, there by adversely affecting the crop yield. The nitrogenous fertilizer increases nitrate concentration of the ground water. Surveys have found that high nitrate concentration greater than 45ppm in drinking water found in parts of Rajasthan have led to health hazards, especially in children causing diseases like diarrohea and mathemoglodemia. Soil Pollution can be effectively controlled by talking suitable measures against all the major sources causing contamination of soil. Domestic sewage should be fully treated through chemical and biological methods before disposing the final effluent land for disposal. 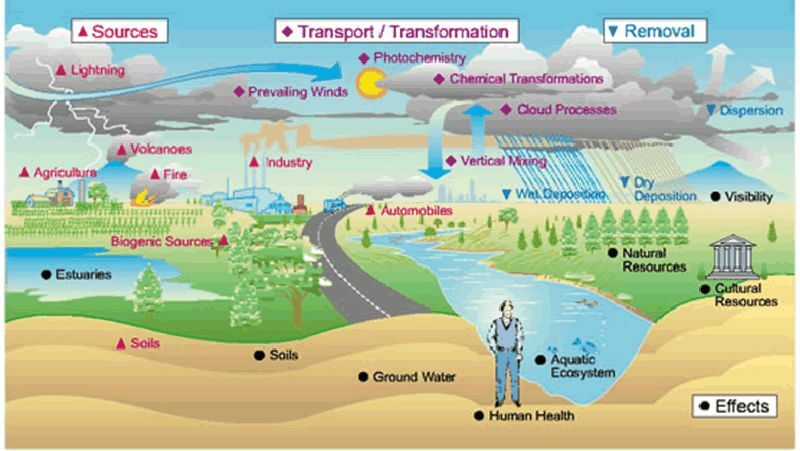 All industries wastes should be treated at source before letting them into the sewers or water bodies for disposal. 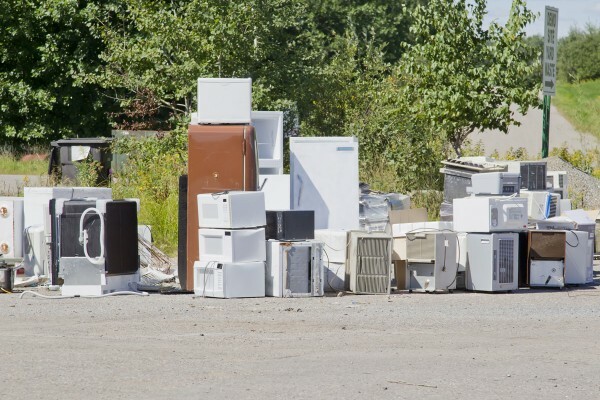 Proper care should be taken in treating heavy metal wastes and other obnoxious materials. Municipal wastes need to be properly segregated. All the biodegradable wastes should be scientifically treated before disposal. The non-biodegradable wastes should be sorted out and discarded stuff like paper, plastics etc. removed for recycling and reuse. As leachates flow over land surfaces and cause nuisance due to bad odor and contamination of surface and ground water sources, their entry can be prevented by lining the pit with suitable plastic or cement concrete material. Alternatively controlled tripping may be used. In this, wastes are spread in thin layers, closely compacted and then topped by layer of soil. Alternate Soil and solid waste layers pile to fill up the depression in the ground. With passage of time, the trash is decomposed on its own and turns ground into reusable soil. Modern practice of intensive agriculture contributes to the deterioration of agriculture land. Proper agricultural practices should therefore be followed to enable soil retain its fertility and productivity.